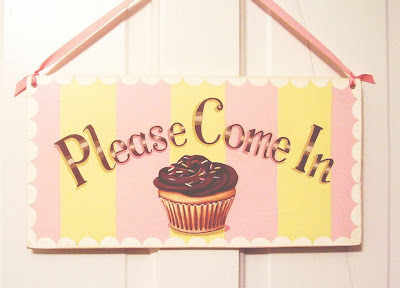 I believe this sign was painted for a bakery - with very good taste (obviously!). Jenny Heid from Everyday is a Holiday is an amazingly talented artist - along with her boyfriend, Aaron. Their creations are just adorable, and you could own your very own masterpiece from their online shop! 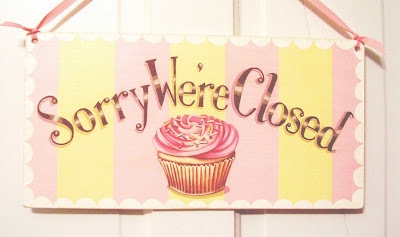 I am in love with this sign, and if I ever get to fulfill my dream of designing a bakery, you can bet I'll be putting in a custom order for an "open" and "closed" sign. Sooooo cute! I generally don't begin a house tour with the bathroom, but this is the sweetest room I've ever seen! I love the stripes on the wall, and I'm eyeing those pretty towels. Just a cute lil' setup! 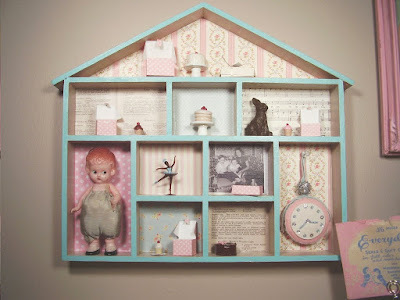 I love the idea of a different shabby chic-ish paper in each box. And just look at the cute little cakes! Here's some more striped cuteness! I love the sign. I need to ask Jenny if it's one of her masterpieces, or just a great find. Now this is one of her masterpieces, and one that I like very much. I have a really bad sweet tooth, and I love to bake. If you've spent any time on etsy, then I'm sure you have run across the "Keep Calm and Carry On" signs. Isn't this the greatest twist ever on that saying?! 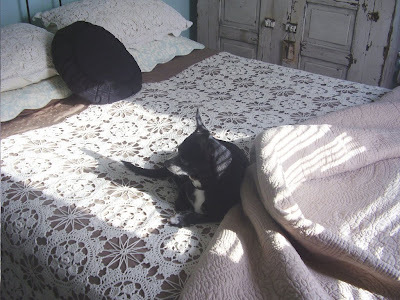 Isn't the bedding sweet?! It reminds me of this. Carlos is pretty cute too! And that my friends, brings the first house tour (at my new blog address) to a close. Jenny has a bunch of adorable photos of her home and work on her flickr page...I would do some more sharing, but obviously I need to cut back on photos a bit, so I don't have to start a third blog any time soon! Thanks a bunch for the photos, Jenny! Thanks so much for the super fun mini tour of our home/world! 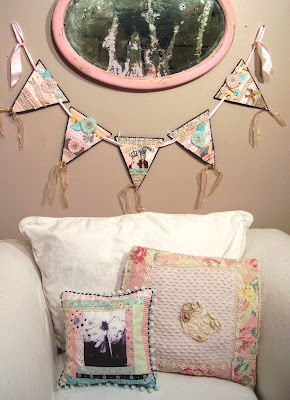 We are honored to be a part of your fab blog!! I'm just honored to "know" you! You are so sweet, and I am in awe of your impressive resume. :) What an amazing boyfriend! I LOVE that Ritz Bakery sign. Go Aaron!!! Thanks for passing along my new address - I really appreciate it. Jo James - I totally agree! Yay for Aaron. My husband wouldn't tolerate so much of it, but I would definitely HAVE more pink if he would! I think the bathroom is my favorite too! I loved the vintage state plates that were hanging in the bathroom...so cute. Mold - No. Moulding - Yes! Hi, I'm Abby! You can find me on Pinterest (www.pinterest.com/sopickincute), and I am a blog contributor over at Shop Sweet Lulu (www.shopsweetlulublog.com) and Confetti Sunshine (www.confettisunshineblog.com). I hope you'll check out my posts!